Nordea Campus Food Market located in the Vallila district of Helsinki is one of the largest staff restaurants in Finland. 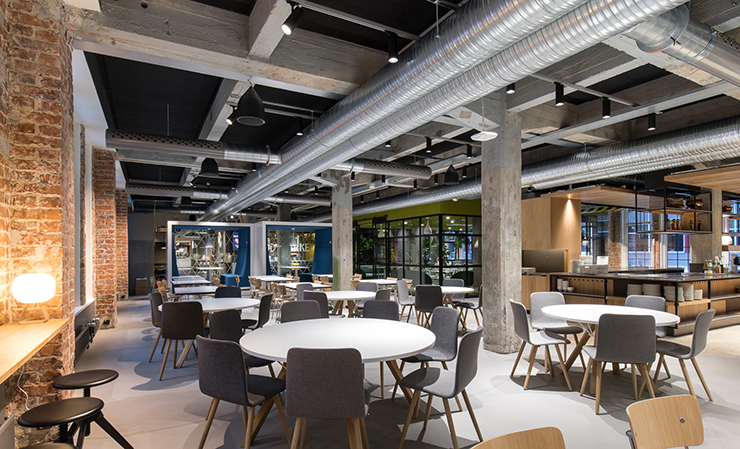 Interior architects Gullstén & Inkinen took part in its revamping, the purpose of which was to improve the functionality of the large space and highlight the building’s industrial spirit. Now the restaurant offers areas for various type of work, meetings and spending time together. Nordea’s staff restaurant Campus Food Market serves more than 2,000 lunches every day using four different meal concepts. It is one of the largest staff restaurants in Finland. The restaurant operator is ISS. The space was renewed into an impressive and inspiring complex in November 2017. The basis of the revamping was to diversely utilize the space that stood empty outside the lunch hours. Another principle was to highlight the building’s eventful history. The restaurant is situated in an old industrial building in the middle of the Nordea Campus block in Vallila. The building was originally completed in 1916 for the use of the Polsa & Merivaara metal bed factory. After this from early 1930s to mid 1980s, it functioned as an auto body shop for Suomen Autoteollisuus Oy and later Sisu-Auto. Now the client wanted to revive the old industrial spirit of the restaurant. Old red-brick and concrete surfaces were revealed and carefully highlighted. 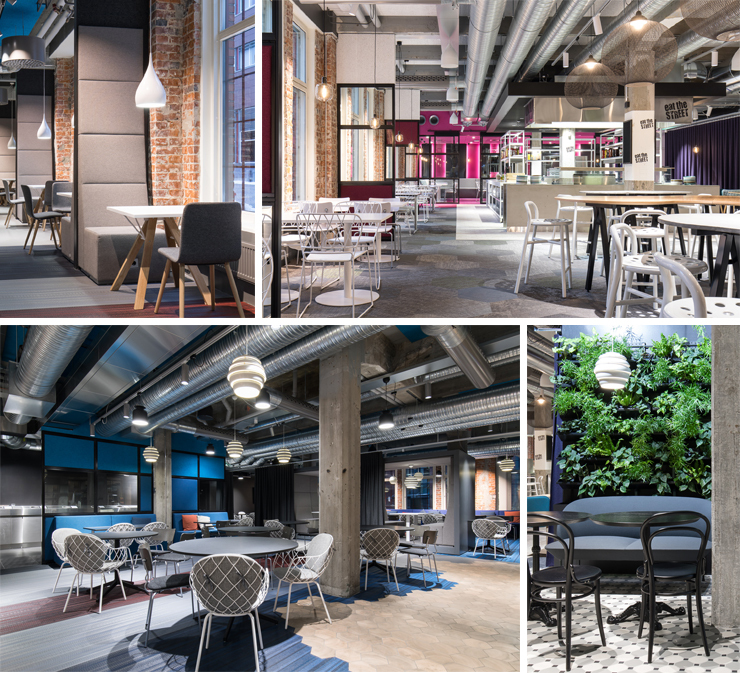 Sustainability was considered in the procurement, and old renovated restaurant furniture as well as lighting fixtures recycled from Nordea’s earlier locations contributed to the atmosphere. The third objective was to improve the functionality and acoustics of the large room. The restaurant encompasses approximately 1,400 square meters. It used to have one long service line for queueing food. The revamped complex includes two food lines and a separate street food area, Eat the Street, as well as a cafe with take-away options. The space has been divided into areas that each have different atmosphere and soundscape. In addition, there are several environments for working, meeting people and spending time together. There are five areas that can be separated from the rest of the restaurant with curtains and glass walls and that can be used for catering events for small groups. Moreover, there are retreats for ad-hoc lunch meetings. The purpose of the modern yet laid-back cafeteria is to attract the staff to use the space for work and fun also outside the lunch hours. Campus Food Market is literally right in the middle of the Nordea Campus, and thanks to the revamping, it is now the pulsing heart of the area.